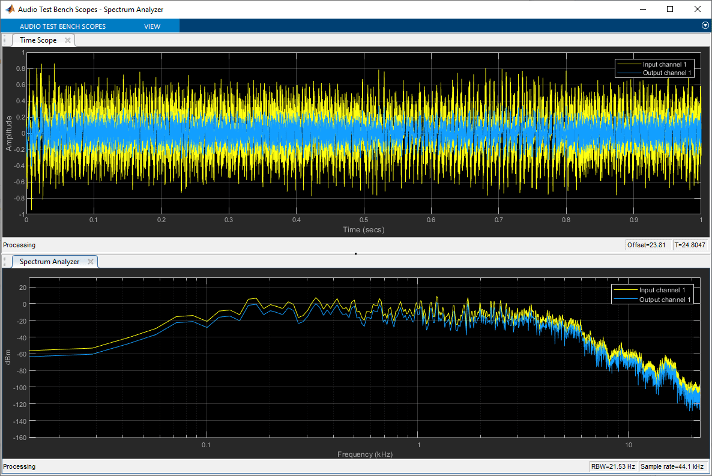 In this tutorial, explore key functionality of the Audio Test Bench. The Audio Test Bench app enables you to debug, visualize, and configure audio plugins. In the Object Under Test box, enter audiopluginexample.Strobe and press Enter. 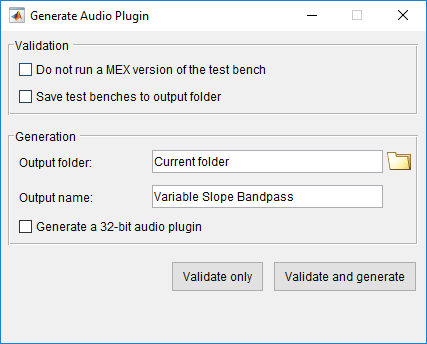 The Audio Test Bench automatically displays the tunable parameters of the audiopluginexample.Strobe audio plugin. The mapping between the tunable parameters of your object and the UI widgets on the Audio Test Bench is determined by audioPluginInterface and audioPluginParameter in the class definition of your object. In the Object Under Test box, enter audiopluginexample.DampedVolumeController and press Enter. 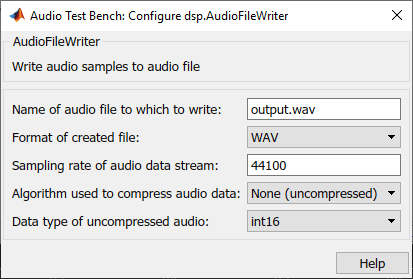 The Audio Test Bench automatically displays the tunable parameters of the audiopluginexample.DampedVolumeController audio plugin. To run the Audio Test Bench for your plugin with default settings, click . Move the sliders to modify the Gain (dB) and Transition Delay (s) parameters while streaming. To stop the audio stream loop, click . 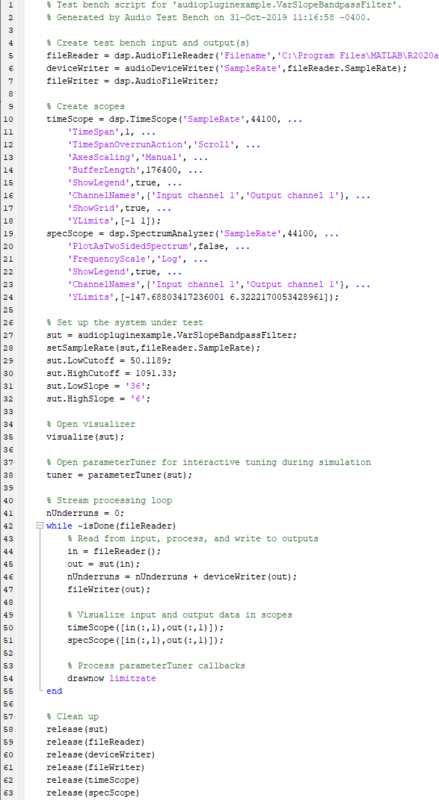 The MATLAB command line and objects used by the test bench are now released. To reset internal states of your audio plugin and return the sliders to their initial positions, click . Click to run the Audio Test Bench again. To pause the Audio Test Bench, click . To open the source file of your audio plugin, click . You can inspect the source code of your audio plugin, set breakpoints on it, and modify the code. Set a breakpoint at line 63 and then click on the Audio Test Bench. The Audio Test Bench runs your plugin until it reaches the breakpoint. To reach the breakpoint, move the Transition Delay (s) slider. To quit debugging, remove the breakpoint. 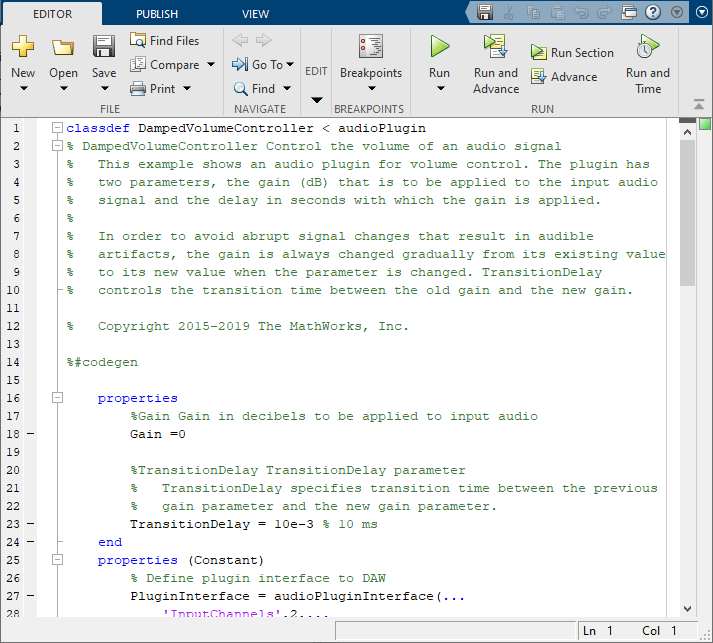 In the MATLAB editor, click Quit Debugging. To open a time scope to visualize the time-domain input and output for your audio plugin, click . To open a spectrum analyzer to visualize the frequency-domain input and output, click . To release objects and stop the audio stream loop, click . Click to open a dialog for Audio File Reader configuration. You can enter any file name included on the MATLAB path. To specify a file that is not on the MATLAB path, specify the full file path. Press Enter, and then exit the Audio File Reader configuration dialog. 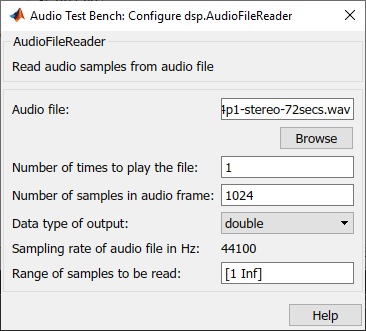 To run the audio test bench with your new input, click . To release your output object and stop the audio stream loop, click . None –– The audio signal is not routed to a file or device. Use this option if you are only interested in using the visualization and tuning capabilities of the test bench. Choose to output to device and file by selecting Both from the Output menu. To open a dialog for Audio Device Writer and Audio File Writer configuration, click . If your audio plugin has a custom visualization method, the button appears on the Audio Test Bench. In the Object Under Test box, enter audiopluginexample.VarSlopeBandpassFilter and press Enter. To open the custom visualization of audiopluginexample.VarSlopeBandpassFilter, click . 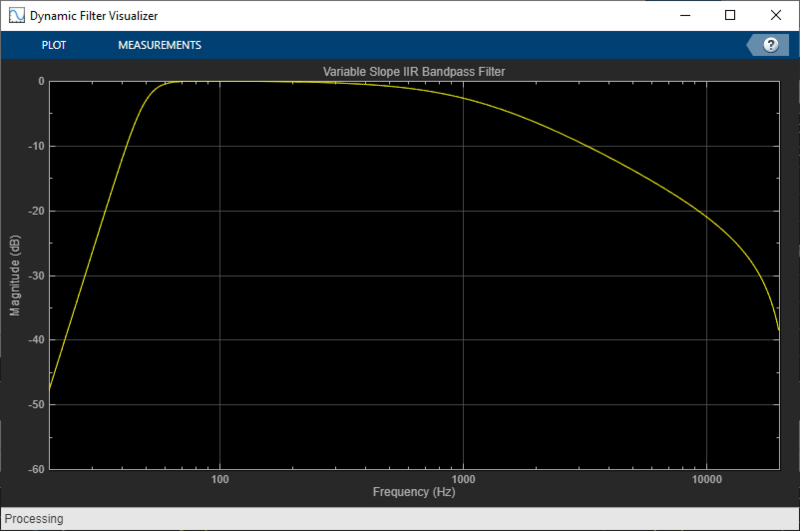 The custom visualization plots the frequency response of the filter. Tune the plugin parameters and observe the plot update in real time. Custom visualizations are MATLAB-only features. Custom visualizations are not available for generated plugins. If you have a MIDI device connected to your computer, you can synchronize plugin properties with MIDI controls. To open a MIDI configuration UI, click . Synchronize the LowCutoff and HighCutoff properties with MIDI controls you choose. Click OK.
See configureMIDI for more information. To run your audio plugin, click . Adjust your plugin properties in real time using your synchronized MIDI controls and sliders. Your processed audio file is saved to the current folder. To open the validation and generation dialog box, click . 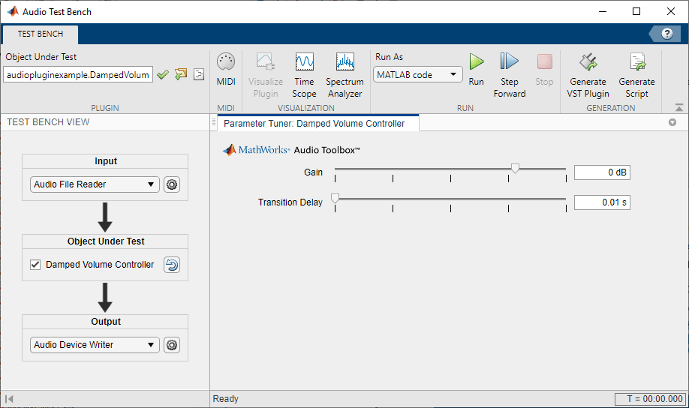 You can validate only, or validate and generate your MATLAB audio plugin code in VST 2 plugin format. The Generate a 32-bit audio plugin check box is available only on win64 machines. See validateAudioPlugin and generateAudioPlugin for more information. 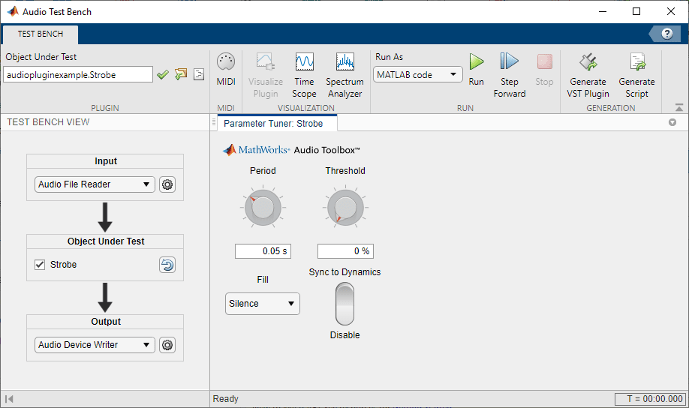 To generate a MATLAB script that implements a test bench for your audio plugin, click . You can modify the code for complete control over the test bench environment, including the ability to create processing chains by placing plugins in cascade.